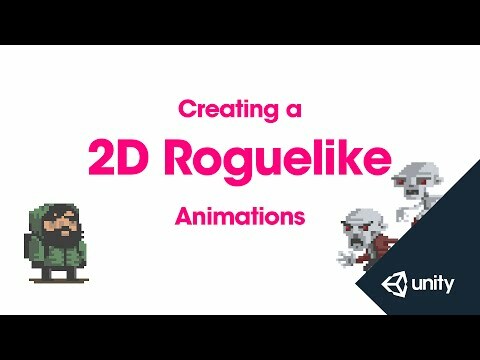 This is part 2 of 14 of the 2D Roguelike tutorial, in which you will setup the player and enemy animations, and create their prefabs. Welcome back to the scavengers video series. the project and demonstrated the finished product. and also setup the player and enemy prefabs. along with the animations the go with him. and we're going to label that Player. sprites you can see the information linked below. shift-clicking the last frame that I wanted. the player is not doing anything. We're going to put this in our Animations folder. which is going to display the current sprite frame. And an animator which is going to allow us to play animation. animation which we saved in our Animations subfolder. And we're going to add some more animations to the player. Let's go back to sprites. and we'll call these PlayerChop. animator controller that's already on the player. We're going to repeat the process with the PlayerHit animation. And next we can check to make sure that that's working. which is going to be half of our normal speed. between those states via script. a tag to the player, of Player. and typing those in to these fields. and we're also going to set the layer. and we've added an additional layer called Blocking Layer. by choosing Add Layer and then typing that in. So we'll go ahead and select blocking layer. we're going to set the sorting layer for the sprite renderer. we've got a Floor layer, which is going to be the background. the floor, which is going to be the food and the soda. And then a Units layer for the player and the enemies. We're going to assign the player to the units layer. check collisions against the player. to move the player using the physics system. and set this to Is Kinematic. player as we go, but for now that's a good starting point. drag it down to our Prefabs folder to save a prefab. and we're going to create our first enemy. and we're going to name this Enemy1. Let's start by adding our animations to Enemy1. We're going to call this Enemy1Idle. frames of our animation as well. We can double check that that's working. There he is, looking good. And now let's add our box collider and rigidbody as well. and assign the enemy to our blocking layer. We're also going to set the sprite renderer sorting layer to Units. to the create a prefab of the first enemy. to modify it to create the second one. to our enemy we created a new animator controller. We're going to move that to our Animator Controllers folder. animations have been added here as states. of those and then right-click to delete them. we're going to go ahead and choose delete. in each of the states. Create - Animator Override Controller. so we're going to choose the Enemy1 controller and drag it in. now use our animator override controller. Now if we play the scene. to create a new prefab. and we can save our scene. and save it in our empty Scenes folder. tile prefabs we're going to need to layout the game board.